This invaluable resource guides readers through the process of creating scholarly, publishable prose from the results of quantitative experiments and investigations. It delves into the issues commonly encountered when reporting the results of statistical experiments and investigations, and provides instruction re the representation of these results in text and visual formats. 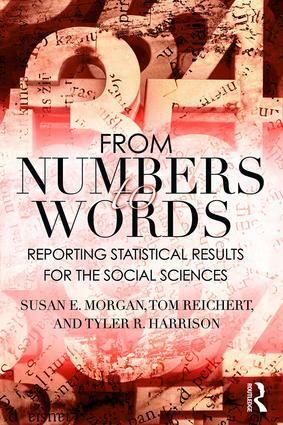 This unique research companion serves as a must-have reference for advanced students doing quantitative research and working with statistics, with the goal of writing up and publishing their findings; it also serves as a useful refresher for experienced researchers. Susan E. Morgan is the Associate Dean for Research as well as the Director for the Center for Communication, Culture, and Change, and a Full Professor in the Communication Studies department in the School of Communication at the University of Miami in Coral Gables, Florida. Her research interests involve the design and evaluation of persuasive messages targeting health behavior change in multicultural populations. Tom Reichert is Department Head, Advertising and Public Relations, and the Athletic Association Professor of Advertising in the Grady College of Journalism and Mass Communication at the University of Georgia. His research interests include advertising and mass communication content and effects. He has written or edited seven books about major issues and concerns regarding the uses and effects of advertising on professional practice and culture. Tyler R. Harrison is Professor in Communication Studies at the University of Miami. His research interests focus on the design of communication processes and systems to improve individual, organizational, and societal outcomes. His work in this area has focused on health communication and conflict management.